The Look Book, a quarterly brochure: from artwork files supplied our task was to produce PDF’s, make any amends, proof read and print, finish, shrink wrap into packs and deliver to the warehouse. Time and colour critical. Press passing is part of our service. The Monthly Newsletter: Services provided on this issue, photography emailed to their in-house designer, then from file supplied, proof read, email PDF’s, make amends, print, finish, mail out to the individual Consultants. Mary Kay is one of the largest direct sellers of skin care and colour cosmetics in the world. 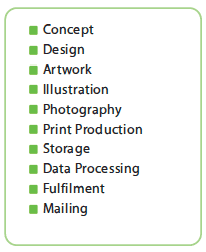 Their print production is colour and time critical. We have had the privilege of working closely with HF for a number of years, originally supplying print, then developing the relationship to include the whole campaign package from concept, design, artwork, print, fulfilment, handling the mailing distribution and data processing. 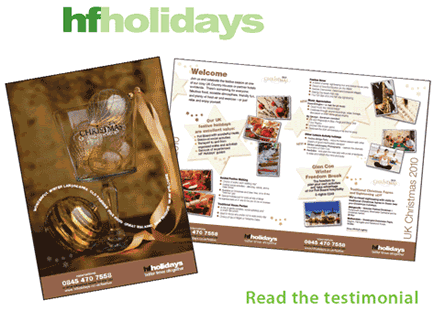 HF is constantly updating their holiday offers and we work with them to make sure their customers receive up to date information. HF Holidays is the UK’s largest specialist Walking and Leisure Activity holiday company and have recently won the Guardian and Observer Travel Award for best tour operator.